There’s no doubt about it: sometimes the law is just plain confusing. And there’s good reason why reader Patricia Taylor was a little bit puzzled by the language of a legal record she came across about a man she’s trying to nail down as someone who is or isn’t sitting there on a branch of her family tree. The question is whether the record she found relates to her family member — and whether the case itself was a state case or a federal case. The name matches, you see — Jacob P. Dunn — and Patricia’s Jacob P. Dunn did live in Pennsylvania in the 1830s, and was born in New York around 1779. But to find out more about this Jacob P. Dunn, she needs to look at the records of this particular case. With all the references here to federal law, it’s easy to be confused as to what kind of case this is. So let’s start by talking about what’s going on here. This particular Jacob P. Dunn was indicted — charged with a crime3 — in a Pennsylvania state court. 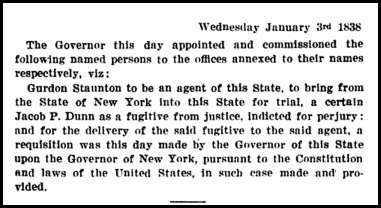 The particular charge was perjury — lying under oath.4 At the time this record was made, in January 1838, this Jacob was in New York, and Pennsylvania wanted him back to stand trial. But Pennsylvania didn’t have any authority to make somebody come to Pennsylvania from another state like New York. The only way it could force the person to come back was to get New York to go along. Remember, these are early days for the United States, and states were particularly protective of their own rights and privileges. So one State had to ask another State to send the guy back. In fact, there are a lot of words that might be — and often are — used in these kinds of cases. whenever the executive authority of any state in the Union, or of either of the territories northwest or south of the river Ohio, shall demand any person as a fugitive from justice, of the executive authority of any such state or territory to which such person shall have fled, and shall moreover produce the copy of an indictment found, or an affidavit made before a magistrate of any state or territory as aforesaid, charging the person so demanded, with having committed treason, felony or other crime, certified as authentic by the governor or chief magistrate of the state or territory from whence the person so charged fled, it shall be the duty of the executive authority of the state or territory to which such person shall have fled, to cause him or her to be arrested and secured, and notice of the arrest to be given to the executive authority making such demand, or to the agent of such authority appointed to receive the fugitive, and to cause the fugitive to be delivered to such agent when he shall appear: But if no such agent shall appear within six months from the time of the arrest, the prisoner may be discharged. And all costs or expenses incurred in the apprehending, securing, and transmitting such fugitive to the state or territory making such demand, shall be paid by such state or territory. Now that sounds pretty definitive, doesn’t it? If one State asks, it “shall be the duty” of the other State to arrest the dude and hand him over, right? See, not all the States regarded the same sorts of things as criminal. And the first time the issue of this extradition clause came up before the U.S. Supreme Court, it came up in the context of a man wanted in Kentucky for helping a slave girl escape. Kentucky demanded that Ohio send the guy back for trial; Ohio’s Governor William Dennison said no; Kentucky asked for a court order making Dennison send him back. So the bottom line here was that Pennsylvania could ask to have the guy sent back, New York was supposed to say yes and hand him over to the agent — the Gurdon Staunton appointed by Governor Ritner in the order — but even though federal law said that, federal courts kept a hands-off approach if the two States got into a squabble. In other words, the records of the court case and of this whole extradition-rendition process — if they still exist today — are going to be in State records, and not in federal records. First place to look: the archival records of the two Governors. The Pennsylvania State Archives, in Record Group 26, Records of the Department of State, series 26.11, Extradition File, 1794-1890, 1906-1914, holds files described this way: “Extradition orders signed by the Governor of Pennsylvania requesting other Governors to extradite prisoners from their states to the Commonwealth and letters from the Governors of other states requesting extradition of prisoners from Pennsylvania. Information generally given is date of extradition order, name of prisoner, nature of the crime alleged, and signature of the Governor or others requesting the extradition.”13 If it survives, the Dunn extradition file may be there. Instead, most of Seward’s papers are held by the library at the University of Rochester, and have been microfilmed there. And among them… files of extradition requests — though it isn’t clear whether these were incoming, or outgoing, or both. If the records of either Governor still exist for this case, the file should contain a copy of the indictment — remember, that’s what the federal law required — and that will lead Patricia to the specific court where the indictment for perjury originally came from and, we can hope, the file there that says whatever happened to Jacob P. Dunn. I don’t know if they still are, but those Pennsylvania Archives you mention used to be available at Fold3. Apparently there was an agreement that Fold3 could publish those records but could not charge for them. So you didn’t have to be a member of Fold3 to access them. I spent many hours going through them until Fold3 changed its “workings” and it became more difficult to search and less accurate. Then I decided to look to other sources. The published books still are on Fold3, Mary Ann. It’s annoying to have a set of books called the Pennsylvania Archives, and a repository called the Pennsylvania Archives with the original records. Thanks, Judy! All I know is that I got quite a bit of the history of my early (1662 – mid-1700’s) Hendricks/Hendrix forebears from the archives at Fold3! I knew they were probably transcriptions, but as close as I might ever be to the originals.